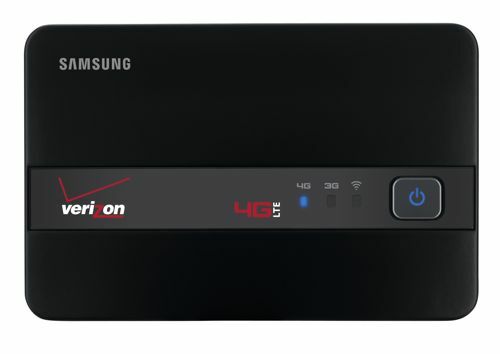 Samsung’s mobile hotspot for Verizon’s LTE network. Credit: Verizon. Samsung’s portable Wi-Fi hotspot for the Verizon LTE network is now available from the Verizon Wireless website, for $100 after rebates and a 2-year contract; however those wishing for an unlimited plan are out of luck, since the mobile hotspot will use the same data plans as the already launched LTE USB modems — $50 for 5 GB per month, or $80 for 10 GB per month. The device (which we saw working live in the wild last week at CTIA) will be in stores Thursday, according to Verizon. In addition to LTE access it also provides backward-compatible access to Verizon’s 3G network so it can be a reliable broadband supplier to as many as five Wi-Fi devices you may have in your arsenal. For road warriors who spend a lot of time in major airports this device may be just the ticket since Verizon’s early LTE rollouts have made airport access a priority. It will be interesting to see how sales of this device stack up against the first offering in this arena, the Sprint Overdrive, which is now in its second iteration. Let the 4G pocketspots battle begin! With Verizon and Apple’s announcement this week of portable hotspot capability in the upcoming iPhone 4 from Verizon and today’s apparent confirmation of that being a new standard for Apple’s devices, it appears the rise of the in-phone pocketspot is complete. Once considered a carrier’s worst nightmare, the ability to use your phone as an all-devices connectivity tool is now table stakes for the entire smartphone industry. Since the arrival of the first true 4G pocketspot — the Clear Spot from Clearwire — we’ve been big fans of the category that our pal Andy Abramson nicknamed pocketspots, for their ability to pack an entire Wi-Fi hotspot into a pocket, purse or backpack. The simple concept is a powerful one and speaks to a trend that should grow over the next year, simply that of folks being able to use one data plan for multiple devices. While integrated family plans that share a bucket of bits are probably a bit in the future, a pocketspot like the Sprint Overdrive does just that today — allowing users to share a single cellular broadband connection with whatever Wi-Fi enabled smartphones, pads or laptops they have nearby. With Verizon’s device suppliers adding portable hotspot capability to almost all the new phones coming for its 4G LTE network (plus introducing a couple new standalone devices) it’s clear that portable shareable broadband is something consumers want, or at least want to have. As we all increase our stack of mobile devices, having a single way to connect them all makes a lot of sense. So welcome, in-phone pocketspot. We’ve been waiting for you.